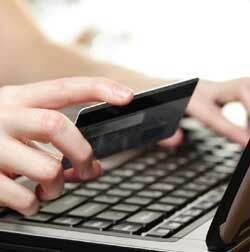 E-Machines offers retailers a myriad of debit & credit card processing solutions to suit your needs and resources. Whether you need simple terminal-only applications, integrated terminal/printer/PIN Pad/check imager solutions, or state-of-the-art wireless, mobile or online credit card processing solutions, E-Machines has the equipment, software and expertise to find the solution that fits your business. Merchants should never have to turn away a customer because they can’t accept the way they want to pay. E-Machines offers a variety of POS credit and debit card processing solutions that make credit and debit card payments fast, easy, and reliable. Request Info on Credit & Debit Card Processing. 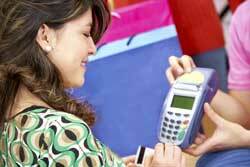 We offer industry-leading credit and debit card terminals. Is your business on the move, in more ways than one? If your business takes you out of a brick-and-mortar and onto the street, you need a wireless credit card terminal for mobile credit card processing! Whether you need to accept payment on-site at your clients' home or business, in a conference booth, or wherever your business may take you--wireless credit card terminals can help increase sales, efficiency, and offer unparalleled opportunity and flexibility to you and your customers. Increase Sales with Wireless Terminals. Contact us today. 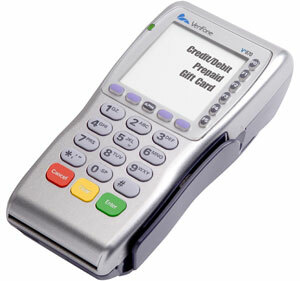 E-Machines offers wireless credit card terminals that are compact, lightweight and portable enough to take anywhere. Whether it’s a trade show, a football game or a Renaissance fair--wherever you need to accept payment, our wireless terminals make mobile credit card processing possible. Stop missing out on sales to customers who didn’t bring enough cash! Stop spending additional fees renting phone lines at conferences! Stop paying higher rates on transactions because you couldn’t swipe the card! NEED A SECURE PAYMENT SOLUTION IN YOUR BACK POCKET? E-Machines is proud to offer QwickPAY® mobile credit and debit card acceptance. QwickPAY is a complete POS payment solution that delivers unmatched convenience without sacrificing security. QwickPAY provides the ability to easily accept credit and signature debit sales anytime, anyplace. Easy-to-use, this mobile credit and debit card acceptance solution can help you lower the cost of accepting cards by as much as 30%. When your customers want to pay with a card, QwickPAY is the safest way. Don’t type… safely swipe credit or signature debit cards on a variety of Magtek® secure card reader authenticators (SCRAs). E-Machines offers full-service eCommerce payment processing (or online credit card processing) solutions with shopping cart, inventory management and payment processing functionality. We provide merchants with gateway payment processing services and a variety of applications certified for conducting internet payments. Most of our applications offer integrated shopping carts with inventory management capability and real-time payment acceptance. Improve your eCommerce capabilities. Contact us today. Our online credit card processing solutions provide an integrated solution that allows merchants to process credit card transactions in card-present or card-not-present situations, for sales that take place in person, on the web, by phone or via mail order.